Assuming this is the last in the series, this was a good book to end with. Cole Merrick and Grace Eversea discovered each other one summer and fell in love. 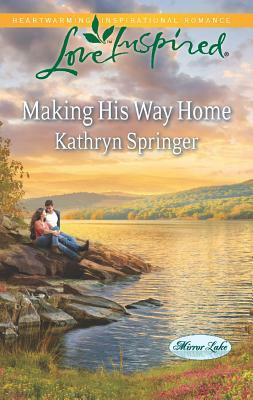 Promises of a future were in the air when circumstances beyond his control caused Cole and his family to suddenly leave Mirror Lake - and Grace. Grace was heart-broken, never forgetting the special love she felt for him. Cole tried to get in touch with her a couple times, but things came up. Because of his mother's depression over losing her husband, Cole was the only one who could raise his three younger siblings, work, and keep a roof over their heads. But finally he's free! He discovers the house his grandfather owned in Mirror Lake is his, and he goes home for only one reason - to sell it and expand his business. A celebration in Mirror Lake made for some good, comical relief in this otherwise tense book. Cole and Grace got stuck together having to be part of a competition. It was so cute! But any progress they made came to a screeching halt when Grace overheard his conversation with his sister and jumped to a startling conclusion. They could never be together! Instead of asking him about it, she allowed her own assumptions to take control. Before long, she was sure he was dead-set against something very, very important in her life. I admired Kate for taking on such a huge responsibility. But what made this story extra special is how Cole SHOWED his intentions instead of SAYING his intentions. I think that in the end that really made all the difference for Kate.